2013 Raffle Winner: $5 Turns into $4,100! 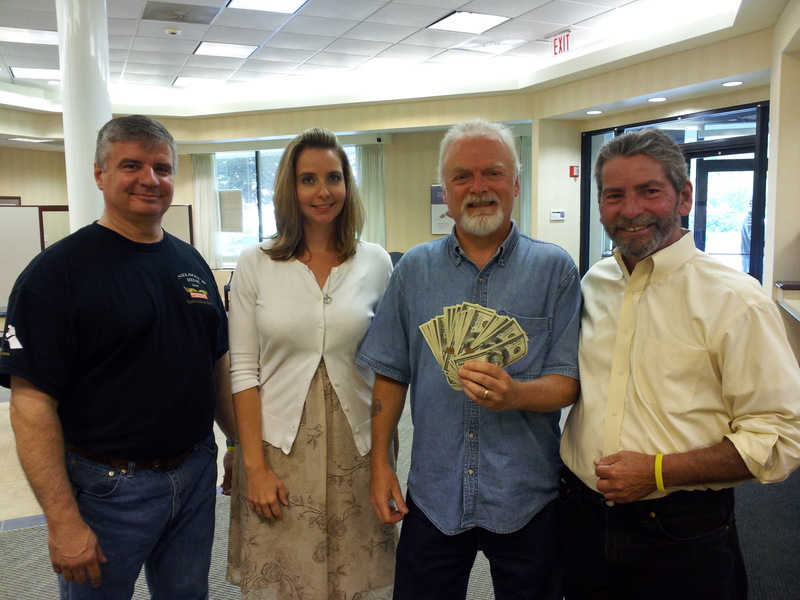 One Chance, One Ticket, One Pull, and “PUFFF” – $5 turns into $4,100 ca$h to our 2013 Survivor’s Fund 50/50 Raffle winner, Dave H., of Salem, shown with Renee of First Ipswich Bank, Don Rivet, MMSF Treasurer, and Paul W. Cote. Dave bought his winning ticket at the KevMarv Wilmington Bike Show. Jen S., of Groveland won $50 of lottery tickets and “Ugly Mike” won 3rd prize – $25 worth of Lottery Tickets. Thanks to everyone who sold and purchased tickets. Our 2014 raffle will start in November with the drawing at the 15th Annual Nelson’s Ride in August 2014. This entry was posted in Events, Photos, Raffle and tagged cash, first ipswich bank, nelson's ride, raffle, winner on August 22, 2013 by mmsf.